This Quebec Maritime story follows our British Columbia (BC) post on the Dogsled Mail Run. Each describes an unusual way that mail was delivered in Canada. In 2010, Canada Post issued two stamps commemorating these unique mail deliveries. I stumbled on both while researching dogsledding in Canada. Even though I was raised in Quebec, I’ve never been to Quebec’s Magdalen Islands (aka Îles de la Madeleine), the site of the second unusual mail story. Reproduction « ponchon » barrel at Musée de la Mer, on the Magdalen Islands, in the Gulf of St-Lawrence between Newfoundland and Nova Scotia. Magdalen Islanders knew they had to come up with a way to deliver the mail, but island fishing boats were deemed too dangerous to sail because of moving ice. That’s when local, Alcide J. Gaudet, came up with the idea of using an empty molasses barrel. 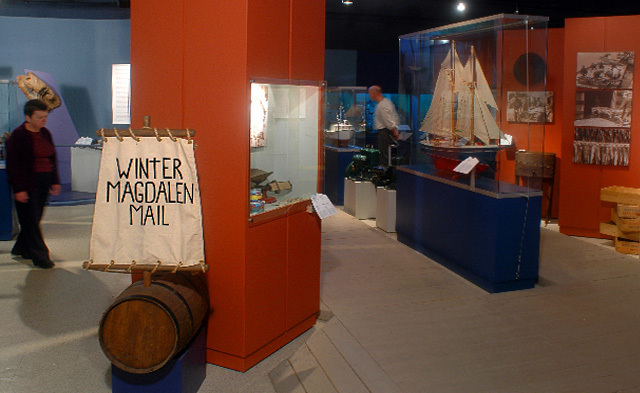 Letters were placed in the barrel, a sail and rudder were added and they signed the barrel “Winter Magdalen Mail”. It was launched on February 2, 1910 and just over a week later, it washed up near Port Hastings, Nova Scotia. Murdoch McIsaac found the barrel and when he opened it, he discovered a note from the islanders requesting their mail be delivered, so that’s what McIsaac did. Although the molasses barrel has long since disappeared, one of its letters survived and is on display at the Magdalen Islands’ Musée de la Mer (Museum of the Sea). According to a Magdalen Islands blog, in the 1990s, a second group of islanders tried to recreate the barrel launch. Despite launching in similar weather, tides and currents, their barrel was lost at sea. One of our Montreal friends, Steve, is a huge windsurfer/kiteboarder and heads to the islands every year. Canadian travel journalists, Katherine and Eric Fletcher are also big fans and include the Magdalen Islands in their Quebec Off the Beaten Path guidebook. Katharine also gave me a good travel tip. She suggested we drive to Prince Edward Island, hop on the Souris ferry, tour the Magdalens and then catch the ferry and return to central Canada via the St. Lawrence River. Magdalen Islands and Quebec Maritime tourism sites are informative and the staff I spoke to at both were helpful too. I think it’s time for a visit. Les îles de la madeleine are well worth a visit, in Summer, it is green grass on top of orange cliffs, very colorful villages, friendly people, you will surely like them. To know a little bit more about the Magdalen Islands (Îles de la Madeleine), visit our website and plan you stay! It will sure be a pleasure to welcome you on our beautiful archipelago! We are on the Maggies right now and are thoroughly enjoying the beaches and the Acadien culture. We are also getting the full experience of the winds of the Gulf of St. Lawrence!